PRETORIA – ZIMBABWE is neither for the ruling Zanu-PF nor the opposition Movement for Democratic Change (MDC), new president Emmerson Mnangwagwa said emphasising his government would abolish partisan politics that led to economic collapse and political tensions over the last two decades. Speaking at the Zimbabwean Embassy in the South African capital Pretoria on Thursday, Mnangagwa assured Zimbabweans, investors, businesspeople, diplomatic missions and non-governmental organisations that his government was halting its decades-long stance of segregating along political party affiliation, race or tribe. He said his administration was adopting a paradigm shift to restore order and dignity of all Zimbabweans. “We (government) made mistakes in the past,” Mnangagwa conceded. country belongs to all of us,” he told a packed venue. 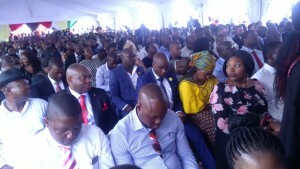 The event was initially scheduled as a breakfast meeting with Zimbabweans living in South Africa but eventually bulged with the attendance of members of the diplomatic coup in South Africa and businesspeople eager to invest in the natural resources-endowed Zimbabwe but whose economy has been wrecked by policies of the administration of Robert Mugabe, the ousted leader. Mnangagwa said the new administration was eager to make up for time lost at the height of partisan policies and political tensions. “As I speak to you right now, our country is 16 years behind other African nations (in terms of development),” he lamented. “As such, we need to catch, and if possible, overtake those countries,” Mnagangagwa said to the applause of thousands foreign dignitaries. He offered an olive branch to adversaries of the Mugabe regime, among them the Diaspora. “For us to move forward, let us leave the bygones be bygones. Yes, we had political issues, but let us forgive one another in order to move forward,” Mnangagwa said. To achieve that, he led by example. “I have forgiven the previous regime that wanted to arrest me. I walked for more than 30 km to the Mozambican border before coming to join most of you in the Diaspora (in South Africa). I have since forgiven them. So, let us all forgive each other,” Mugabe’s former deputy said. He left Zimbabwe under a cloud following his dismissal by Mugabe in November. He was accused of plotting a coup and fanning factionalism. Mnangagwa subsequently fled to South Africa citing threats against him and his family. He returned after the ousting of Mugabe by the army and street protests. Mnangwagwa also reached out to potential investors scared off by the previous regime’s unyielding stance on foreign companies to cede 51 percent ownership to locals under the so-called indigeinisation policies. He said foreigners were now free to come and invest in the country in every area of their choice except in the mining where the policy should remain tilted in favour of Zimbabweans. Mnangagwa said Zimbabwe was aggressively investing towards returning its position as the breadbasket of Africa. It lost that status after the violent seizure of mostly white-owned farms in 2000.
while ensuring government would no longer depend heavily on rainwater but intensify irrigation, construction of new water reservoirs and dams to ensure Zimbabwe has surplus food production for both export and reserve. Meanwhile, the Zimbabwe-South Africa (ZIM-SA) had secured a US$200 million partnership with tractor manufacturer John Deree to provide tractors for farming in 2018. The organisation also secured $100 million for the road repairs and $220 towards the recapitalisation of the dysfunctional Air Zimbabwe. Shingirirai Mutanga, ZIM-SA Forum Secretary General, confirmed the developments while speaking at the event Mnangagwa addressed. “It gives us an opportunity to invest in infrastructure development for Zimbabwe,” Mutasa said. Speaking at the same event, Jonathan Chimhandamba of the Zim-SA Business, said the government and Zimbabweans in the Diaspora had to complement efforts to revive the country. “Zimbabwe needs its Diaspora, and the Diaspora needs Zimbabwe. For now, we are not asking the country what it cannot do, but ask what we can all do for Zimbabwe,” Chimhandamba said. Christopher Mutsvangwa (State Minister and Presidential Advisor) and Retired General Sibusiso Moyo (Foreign Affairs) accompanied Mnangagwa.